My name is Daniel Mayer, born on January 10, 1908 in Bollendorf, a small village near the county seat of Bitburg (Kreis Bitburg, Bezirk Trier), across from Luxemburg, on the Sauer River. Half of the village is Luxemburger and the other half is German. It was a beautiful village that attracted many tourists and had many hotels, for example the Hauer or Michels (Hotel de la Poste) or Wirtz on the Luxemburg side. In the summer it was a nice area, tourists took walks in the forests. In the winter, there was snow and in January there was often flooding when the Sauer overflowed its banks. We were 8 children and I was the youngest. My sisters and brothers had made up a song when I was born: “You, we didn’t need.” We were 5 brothers and 3 sisters (Moritz 1891-1943, Paulina 1892-1942, Johanetta 1894-1978, Max 1896-1992, Julius 1897-1918, Sally 1900-1971 and Bertha 1902-1942), the grandmother (Minetta Bonem born Lévy 1838-1924) and my parents (Salomon 1865-1932 et Babette born Bonem 1864-1942). We had a wonderful, unforgettable family life. My grandmother was my mother’s mother and lived with us, she came from Bollendorf and was called Tante Minette. Her maiden name was Levy and she was a sister of Marx Levy. She married Moses Bonem (1829-1868) from Trittenheim. She helped with the housework. When she could not see so well anymore, her grandchildren would say to her: ”Grossmutter, now you have worked hard enough, sit down and rest” and she would cry and say: ”I always did all the work and now they won’t let me help.” When I came on vacation, I always brought her presents, aprons, or shoes or knit sweaters and she was very proud that her children took good care of her. In August 1940, Nice was still a free city, but soon after it was occupied by the Italians. We had to put blue paper on the windows because of the curfew. There was a shortage of heating material, wood was sold by weight and they wet it to weigh even more. The French militia began making lists of Jews. Their food ration cards and their identity papers were stamped with the word JEW. Foreigners were protected by the Italians. We had to hide, Daniel Lévy and I, under the roof of the apartment building we lived in. Food was scarce. Renée Irène and Marthe who could still go out, had to go up to the hills to farmers to try and find carrots and oil to feed Suzanne, there was no milk. 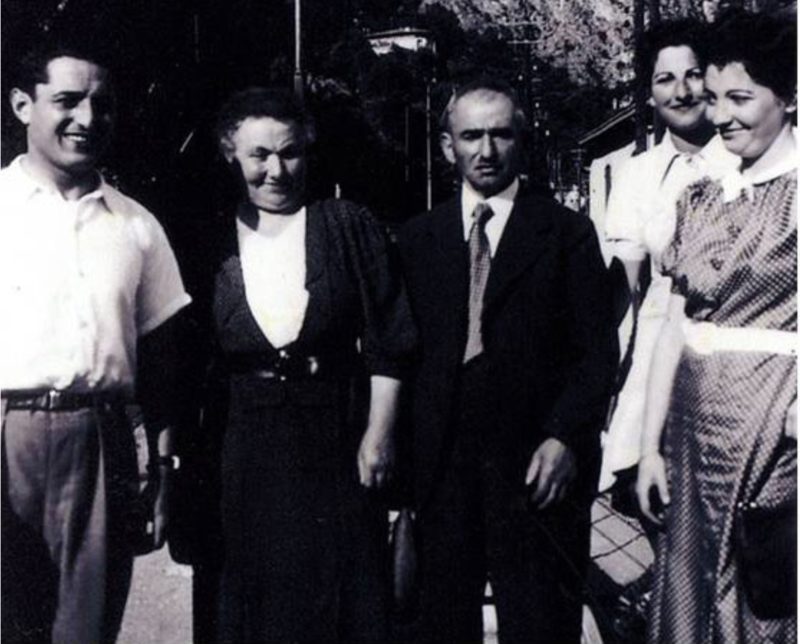 After a period of hiding, in 1943, at our friends Eléonore* and François Giribone* and in a convent, the Mayers left Nice and entered Switzerland clandestinely. Switzerland accepted as refugees families with a child under the age of 6. Marthe, Mélanie and Daniel Lévy went to the southwest of France where they lived on a farm and survived the war. This account was started on December 2nd, 1997 and was dictated to me in French by my father Daniel Mayer over a period of about 18 months, until the time of his death. We called it: Each of us could write a novel. This is where Daniel Mayer, my father, stopped the story of his life. Life improved for the family, Nice was building and rebuilding. Beatrice, my sister , was born in 1946. My grandparents Mélanie and Daniel Lévy lived very near us and we saw them everyday until they died in 1968 and 1971.